J. K. Rowling does it again with her latest book Harry Potter and the Cursed Child book review of the Harry Potter series. The original story was written by J. K. Rowling, and the play production in London, England was adapted by J. K. Rowling, John Tiffany, and Jack Thorne. That show was produced by Sonia Friedman Productions, Colin Callender and Harry Potter Theatrical Productions. Are There Some Familiar Characters? Harry Potter fans, be prepared. Our stories begins with a thirty-seven-year-old Harry. Yes, and he is married with children. We learn this on the first page, so don’t think I’m giving away too many secrets. We also find that he is still friends with old pals, Hermione and Ron. From the very start, it is apparent that things have been going quite well for the three friends. They have important jobs and have acquired a fair amount of success. Some other characters are still around as well. 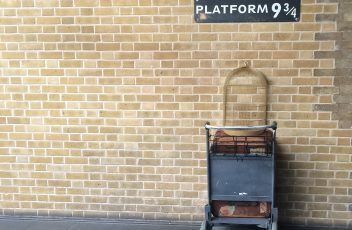 We find Professor McGonagall still teaching at Hogwarts and Dumbledore is remembered fondly. There is a bit of friction between Harry and Draco and even Moaning Myrtle makes an appearance. What’s New About This New Version of This Story? As with J. K. Rowling’s other books, we are taken on a journey through a magical world filled with the impossible unfolding before our eyes. There is conflict at every turn. Ms. Rowling has managed to weave the angst, tension and unpredictability of her wonderful Harry Potter world into this updated story that thrusts us into the future. At one point, the entire story turns on its head and presents an entirely different reality. WHAT FUN! Without giving away too much, Blackcurrant Press would recommend this book to its readers. Please note, it’s written as a play. You will enjoy entering into the wizarding world again, and have loads of fun seeing what has transpired with your favorite characters. The surprises are sharp and witty, just as in her other books. The transitions are believable and unforced. It’s a clever story that keeps you guessing to the end. If you have the way with all, this story is being shown in London, England. 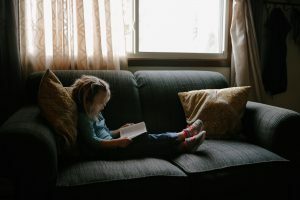 Please leave a comment about this Harry Potter and the Curse Child book review of the Harry Potter series if this review has been helpful. Thank you! Are you still looking at your keyboard when you type? If so, imagine being able to touch type without looking or worrying if you’re typing correctly. Typing software – Mavis Beacon Teaches Typing 18 being reviewed here can make a world of a different with a “hunt and peck” approach to typing. For those unfamiliar with the term, a writer searches for a letter on the keyboard and hits it usually with one or two fingers. 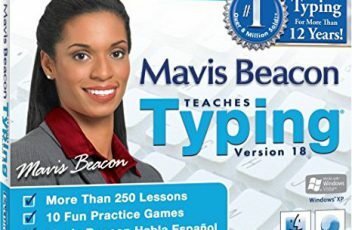 With Mavis Beacon Teaches Typing 18, you’re only a few lessons away from becoming an experienced typist. Truth is, it’s easy and it’s FUN! Make sure your computer can support this application. Mavis Beacon works well on Windows and Macintosh. Windows Xp (Home & Pro) Sp2/Vista¹, Pentium Iii 700 MHz or Higher (800 MHz Processor for Vista), 128 MB Ram (512 MB Ram for Vista), Video Card With 32 Mb of Video Ram, 800 X 600 24-Bit Color Display (1024 X 768 Resolution Recommended), Windows Compatible Sound Card, Speakers, Keyboard & Mouse. Macintosh requires Os X 10.4 – 10.5, Powerpc G4, G5 or Intel Core Duo Processor, 800 MHz Processor or Higher, 256 Mb Ram, Video Card with 32 Mb of Video Ram, 1024 X 768 24-Bit. Both systems require computer speakers, keyboard, mouse, CD/DVD-Rom drive, and 300 Mb of free hard disk space. Plus, Adobe Acrobat Reader in order to view Mavis Beacon User Guide, that is also downloadable for free from company’s website. Right Click on the icon which starts the program. At $14.95, these lessons are extremely affordable! 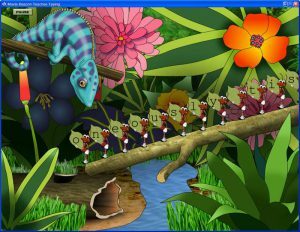 Easy lessons that are GREAT at teaching typing with simple, enjoyable repetitions. Comes in a children’s version and one for professionals. Rated 3.7 out of 5 Stars! Capable of having multiple users with one license. Mavis Beacon has been around since 1987. Screen shot of Mavis Beacon typing lesson. Check first to see if the application will work on your Macintosh. Some users have complaints that it does not work on MacBook Pro. Application is in need of a face lit. The graphics are a bit old-fashioned. After achieving a 50-words-per-minute speed on typing tests, application may become glitchy. Screen shot of Mavis Beacon game. One of the best parts about this software are the games, that are primarily designed for children, but fun for any age. It is an intuitive program too, that has the ability to shift its intensity based on the progression of the user. In other words, as you move through the exercises, the program can give you an analysis of your strengths and weaknesses, that will act as a guide through the remaining lessons. It has greatly increased my skill level, even though I learned in school many years ago. I’d mentioned in another post that I can type nearly at the speed of my thoughts, but had not expressed how wonderful it is to fill a page in a matter of minutes. It’s quite an extraordinary concept. For those who make their livings writing, typing is practically a mandatory skill. If you’ve found this review helpful, please leave a comment below. Thank you. Here’s a concept, speak rather than type all computer functions without having to use a pesky computer keyboard and mouse! Sounds FANTASTIC! Right? Well, it is. There is an application that will make this reality possible. 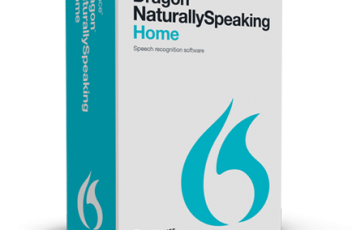 It’s made by a company called Nuance Communications and it’s called Dragon Naturally Speaking. With a little setting-up and a few vocal adjustments, you can be a voice-activated, hands-free computer user. Take a look at some of the details below. Speak naturally and software types, opens and closes computer applications, and learns phrases and word usage enabling it to become more personalized, and voice-driven. Software is equipped with tutorials making it easy to master application functions. Dictate in all areas where one would normally type functions. Nuance has Customer Service 1 (800) 654-1187 and Technical Support 1 (770) 702-6014 for problem solving. 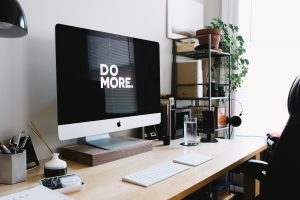 Everything user needs is included in package to begin the process of making your computer a fully functioning voice-command marvel. Dragon works best with a minimum of 2 GB (32-bit) for Windows 7, 8, 8.1 and 10, and 4 GB (64-bit) Windows 7, 8, 8.1. Plus, Windows Servers 2008 R2, 2012, and Windows 10. CPU – Minimum 2.2 GHz Intel dual core or equivalent AMD processor. Dragon can assist those with limited computer skills, allowing them to replace all mouse and keyboard functions with verbal commands. Great for writers who can dictate faster than they can type. Dragon has a 30-day money back guarantee. Easy installation and voice recognition practice homework included. Dragon supports Microsoft Office 2010 & 2013. Dragon receives 3.2 out of 5 stars! Dragon’s mistakes are difficult to correct because many are pronunciation and not spelling. In other words, Dragon may hear speaker dictate “where”, when “wear” is the correct word. This may require extra editing. Dragon does not support dictation into Electronic Medical Record (EMR) systems. However, there is a Dragon Medical Practice Edition for this area. Please be aware that the medical software is over $1,000 to purchase. Nuance’s Customer Service needs improvement. Contacting them may try your patience, making refunds difficult to obtain. Sometimes customers are referred to Nuance Community of users for the answering of their questions. Installing the downloadable version of Dragon can be problematic. Wait for the CD-ROM instead. Imagine all you can accomplish! Having purchased this software several years ago, I am a believer of its good qualities. There is a learning curve, though, for the software to recognize your voice pattern. However, once this is accomplished, this software is quite the handy tool. I’m fortunate to be able to type at the speed of my thoughts, yet I still use this software especially when I’m too tired to type. Writing books of 200-300+ pages can be tiresome, so having this sort of application can really come in handy. As with all software, at times, the technology takes a while to catch up with the needs and demands. Each revision seems to include improvements, but somehow manage to leave out some of the more useful capabilities. This is true, unfortunately, with Dragon. I prefer the earlier versions to the latest. Hard to say what went wrong with the upgrades. Having said that, Blackcurrant Press recommends Dragon Naturally Speaking version 12. There are great applications here for having a hands-free computer. Can you think of any? Click Here to find more information. Please leave a comment below if you found this review helpful. Thank you.